Join ICA Miami in celebrating the opening of its three newest summer exhibitions, highlighting the creative output of three artists at vastly different stages in their careers, each of whom innovatively approaches gender, identity, politics and the role of the artist. Three exhibitions will open concurrently: Ida Applebroog, who has influenced generations of artists, will be represented through historic never-before-seen drawings from the 1970s alongside a selection of recent work; emerging artist Renaud Jerez will create a new site-specific installation for his US solo debut; and Susan Te Kahurangi King’s debut solo museum presentation will be the first comprehensive survey of the work of the self-taught New Zealander. ICA Miami’s summer exhibitions provide a critical platform for audiences to experience the work of three of the most compelling artists practicing today. Taken individually, the exhibitions provide new insight into the creative output of Susan and Renaud, as well as a re-contextualization of the iconic Ida Applebroog. Considered together, their diverse yet complementary practices demonstrate unexpected formal affinities and shared motives. Ida Applebroog, Catastrophe (Chairs), 2012. Courtesy of the Artist and Hauser & Wirth. Photo: Emily Poole. For half a century, Ida Applebroog has innovated across styles—minimalism, expressionism, and cartoon—and mediums, including painting, drawing, film and sculpture. Applebroog frequently combines scenes from urban and domestic life with text, transforming otherwise banal imagery into situations rife with anxiety, irony and humor. The artist is renowned for her investigations of gender and sexual identity, power, politics, and the pernicious role mass media plays in desensitizing the public to violence. Applebroog’s exhibition at ICA Miami is the artist’s first solo US museum show in nearly two decades. Her work has been shown in the United States and abroad, including in solo exhibitions at the Corcoran Gallery of Art, Washington, DC; Whitney Museum of American Art, New York; Brooklyn Museum, New York; The Power Plant, Toronto; Contemporary Arts Museum, Houston; and High Museum of Art, Atlanta. She has participated in numerous group shows and performances, including dOCUMENTA (13), Fridericianum, Kassel, Germany; “The Downtown Show: The New York Art Scene, 1974-1984,” Grey Art Gallery, New York, Andy Warhol Museum, Pittsburgh, and Austin Museum of Art; “Morality Tales: History Painting in the 1980s”, documenta 8, Kassel, Germany; and many others. Applebroog has received several awards, including a John D. and Catherine T. MacArthur Foundation Achievement Award and a Lifetime Achievement Award from the College Art Association. Applebroog’s work is in the collections of The Museum of Modern Art, New York; Solomon R. Guggenheim Museum, New York; The Metropolitan Museum of Art, New York; The Corcoran Museum of Art, Washington D.C.; and Whitney Museum of Art, New York; among others. She currently lives and works in New York. Ida Applebroog “Mercy Hospital” is organized by ICA Miami and curated by Alex Gartenfeld, Deputy Director & Chief Curator.Ida Applebroog “Mercy Hospital” is funded through the Knight Contemporary Art Fund at The Miami Foundation. Major support is provided by the Arlene H. & Laurans A. Mendelson Charitable Foundation; the Ray Ellen and Allan Yarkin Fund for Exhibitions at ICA Miami; and the Dr. Kira and Mr. Neil Flanzraich Fund for Curatorial Research at ICA Miami. Additional support is provided by Toby Devan Lewis and Hauser & Wirth. Renaud Jerez, EXRHB2, 2014. PVC, aluminum, fabric, jersey, rubber, 180 x 55 x 45 cm. Courtesy of the Artist and Crèvecoeur, Paris. 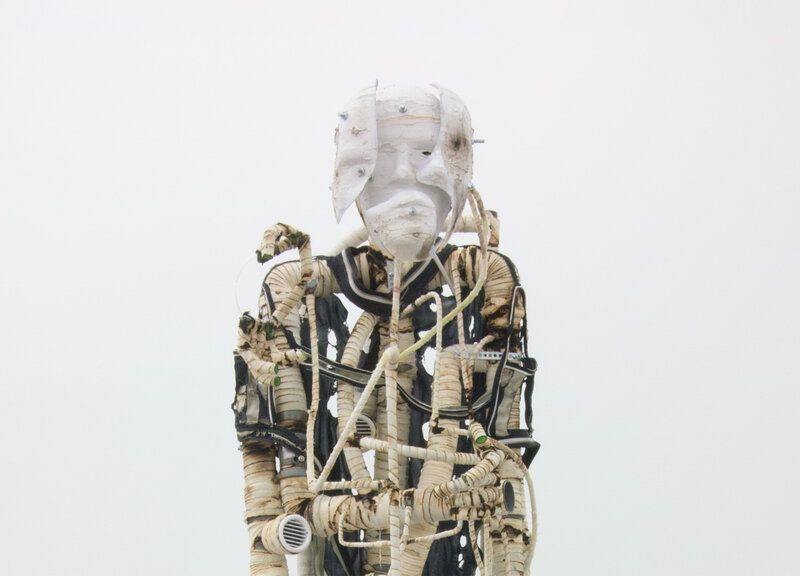 For his first solo exhibition in the US, Renaud Jerez presents a site-specific installation of new work that builds upon his evolving language of innovative, anthropomorphic, and apocalyptic forms. Working across styles and mediums, but with a concentration on sculpture, Jerez uses craft and industrial materials to create haunting, humorous, and abject sculptures that imagine the future through monsters and ruins. Intricate and violent, these forms frequently present a human form consumed with architecture and technology. For his installation at ICA Miami, Jerez presents a dramatic, immersive installation in which his sculptures seem to spectacularly take domicile amidst the museum’s galleries. On display will be new “skeleton” sculptures whose elongated forms suggest bold futurism and elegiac decay, as well as a significant architectural intervention. Jerez was born in 1982 and lives and works in Berlin. Recent solo exhibitions include the National Gallery, Prague; GAMEC, Bergamo, and Auto Center, Berlin. He has been featured in group shows including the 2015 New Museum Triennial, New York; at k11 Art Foundation, Hong Kong; Palais de Tokyo, Paris; and Le Magasin, Centre National d’art Contemporain, Grenoble. Renaud Jerez is organized by ICA Miami and curated by Alex Gartenfeld, Deputy Director & Chief Curator.Renaud Jerez is funded through the Knight Contemporary Art Fund at The Miami Foundation. Major support is provided by the Dr. Kira and Mr. Neil Flanzraich Fund for Curatorial Research at ICA Miami. Additional support is provided by the French Embassy in the United States. Susan Te Kahurangi King, Untitled, n.d. Colored pencil, and graphite on paper. 17 x 12 1/4 in. Courtesy the Artist and Chris Byrne. ICA Miami presents the first museum exhibition of the work of New Zealander Susan Te Kahurangi King. Since early childhood, King has made drawings composed of undulating lines of bold color, refined rendering, and energetic relationships between appropriated cartoon characters, many of which predate pop art. As this exhibition will demonstrate, through the coupling of the artist’s early mature work and her more recent meditations on line and color, King’s decades of artistry—entirely self-taught—have arrived out of an open-ended process of looking. Taken together, the wondrous and unique encyclopedia of images King conceives demonstrates her singular voice. Susan Te Kahurangi King (b. 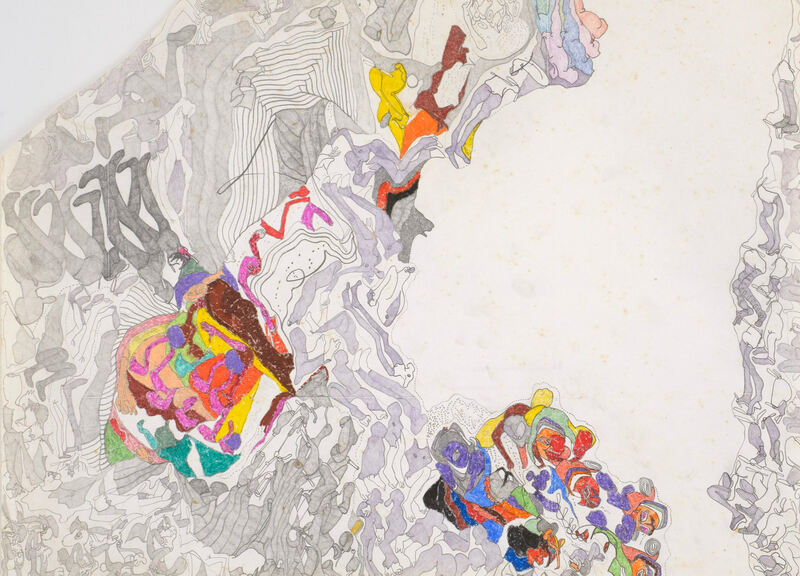 1951, Te Aroha, New Zealand) is an artist living in Auckland, New Zealand, whose work has begun to receive worldwide attention for its innovative and expressive approach to drawing. As a young child, King stopped speaking and has since been diagnosed as severely autistic. Her gifts as an artist were recognized by her family at an early age but would take decades before gaining broader recognition. Since 2009, King’s work has been shown at the Outsider Art Fair in New York and Paris, as well as Andrew Edlin Gallery, New York, and Robert Heald Gallery, Wellington, New Zealand. Her work is in the collections of the Philadelphia Museum of Art and the Wallace Arts Trust, Auckland. Committed to furthering research on Susan Te Kahurangi King and contemporary self-taught artists, the American Folk Art Museum has created a fellowship in her name. King currently lives and works with one of her sisters in the Hamilton neighborhood of Auckland. The exhibition is organized by Tina Kukielski, independent curator and Executive Director of Art21. A monographic catalogue published by Lucia|Marquand will feature essays by Kukielski and Gary Panter, as well as a contribution by artist Amy Sillman. Foreword by Alex Gartenfeld. Susan Te Kahurangi King is funded through the Knight Contemporary Art Fund at The Miami Foundation. Major support is provided by the Dr. Kira and Mr. Neil Flanzraich Fund for Curatorial Research at ICA Miami. Additional support for Susan Te Kahurangi King is provided by Chris Byrne.